Expressing gratitude has been scientifically proven to improve your brain and your life. In this video, Jim Kwik discusses the benefits of gratitude and how you can harness the superpower of thankfulness in your daily life. 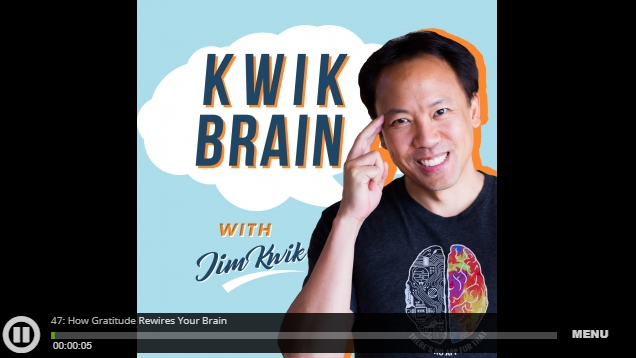 Click the photo to listen to Jim Kwik's 12 minute audio podcast about gratitude. Expressing Gratitude improves your physical health and energy levels. Grateful people experience fewer aches and pains and are healthier.According to a study published in Personality and Individual Differences, grateful people are more likely to take care of themselves.They exercise more often and are more likely to keep regular doctors’ appointments, which contributes to longevity.Writing in a gratitude journal can reduce blood pressure by 10%. Expressing Gratitude improves your mental health. Gratitude reduces a multitude of toxic emotions, including envy, frustration, resentment, and regret.Doctor Robert Emmons, a leading gratitude researcher, has found that gratitude increases happiness and reduces depression. Expressing Gratitude improves your sleep. Expressing Gratitude improves your mental strength. Gratitude not only reduces stress but also plays a major role in overcoming trauma.A 2006 study published in Behavior Research and Therapy found that Vietnam War veterans with high levels of gratitude experienced lower rates of PTSD.Gratitude makes us more resilient to trauma and stressful events. Expressing Gratitude improves your self-esteem. Keep a daily gratitude journal. Every morning and evening, list 3 things that you are grateful for. Try counting all the things you have in your life that money cannot buy. Practice telling others you appreciate them. Feeling gratitude and not expressing it is like wrapping a present and not giving it. Try practicing gratitude with your family at the dinner table or starting meetings with a gratitude practice. I start all of my mastermind meetings with a gratitude practice. Write someone a note of thanks that they are in your life. Look in the mirror. Have a trigger behavior, like brushing your teeth, that reminds you to think of something you like about yourself. Be grateful for something you accomplished or something about your character. Practice mindfulness. In order to have gratitude, you must be present – because you can’t appreciate the present if you’re always thinking about the next thing. Sometimes, you need to slow down to speed up. Spend time in nature, away from your digital devices and stress-causing distractions. The more grateful you are, the more present you become. Reduce judgment. Your inner critic keeps you from feeling gratitude. Check out these other resources for Rewiring Your Brain!